Bird skulls and brains look like those of young dinosaurs, providing clues to their unique evolution and modern success. A new study, published today in Nature Ecology and Evolution, reveals that bird's skulls evolved differently to their relatives and ancestors, and develop more like those of young dinosaurs and crocodiles. Birds are the only surviving members of a group of feathered dinosaurs, and are close cousins to modern crocodilians (alligators, crocodiles and gavials). However, birds have unique skeletons, particularly their beaked skulls, which have wider dome-shaped cranial bones to accommodate proportionally larger brains and eyes. Previously, Dr Arkhat Abzhanov, from the Department of Life Sciences at Imperial, and colleagues determined that the shape of the birds' skulls most resemble those of young non-avian (non-birdlike) dinosaurs. This evolutionary phenomenon is known as 'paedomorphism' – where an adult retains features that are usually only seen at the young stages (embryo or baby) in its ancestors. Paedomorphism is caused by a change in timing of developmental events of an organism – for example growing certain body parts at later stages, slower, or not at all. It is known to play an important role in the evolution of some new species, as the 'young' creatures can adopt a different lifestyle compared to their more 'mature'-looking relatives, avoiding competition for the same resources. To better understand the origins of birds' unique skulls during their evolution from more primitive reptiles, Dr Abzhanov and colleagues from Yale University have now analysed the relationship between brain and skull. They studied how the two structures change relative to each other during embryonic development, in both modern birds and their reptile relatives. The skulls of vertebrate animals (those with backbones) are formed as a series of larger bones that correspond to particular regions of the brain. For example, the frontal bones cover the forebrain while parietal bones cover the midbrain. As the brain grows in an early embryo, the skull closely matches the shape of the brain – the new study shows that the boundary between the frontals and parietals perfectly matches the boundary between the forebrain and midbrain across most vertebrate groups. However, in the later stages of development in dinosaurs, crocodilians and other reptiles, the skull bones no longer mirror the brain growth as closely. Later in development cranial muscles and other tissues also begin to affect skull shape. The team discovered that in birds, this change in the brain-skull relation never occurs, and the roof of the skull continues to match brain shape throughout development. In other words, birds retain their original embryonic brain and skull configuration into adulthood. Dr Abzhanov said: "The skulls and brains of birds are dramatically different from those of adult non-avian dinosaurs and other reptiles, and we can show that these differences reflect how birds evolved to become species of forever-young dinosaurs. "Our study adds further evidence that adult modern birds share much in common with juvenile (non-avian) dinosaurs, an observation which led to the revelation about a specific adjustment to the embryonic development in their ancestor." To conduct the study, the team used a 3D technique to analyse the skull shapes of a wide range of reptiles, including fossilised skulls of early reptilian ancestors and extinct crocodiles and dinosaurs, as well as skulls of embryos and juveniles of modern species, such as alligators and birds. By comparing brains and skulls in both ancient fossils and throughout the early life of modern reptiles, the team were able to use the same analytical approach to look at both evolutionary and developmental aspects of brain-skull interactions. How structures in bodies develop in the embryos have often been found to reflect how those structures changed during evolution. Embryonic humans at early stages, for example, look a lot like embryonic fish, and later in development as embryos of other mammals, betraying our origins on the evolutionary tree. The development of the skull is a particularly complex process, where hard bony tissues have to interact with many other organs, such as the eyes and brain. 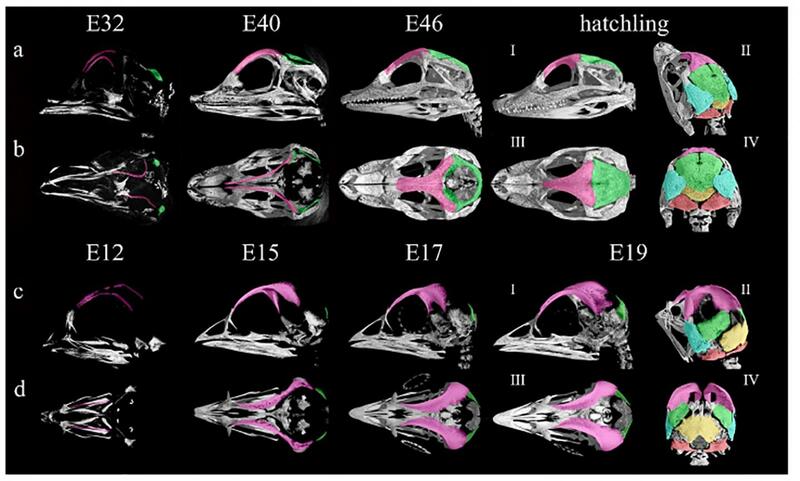 Birds' skulls appear to remain proportionally much larger and rounder than those of other reptiles through development, retaining their embryonic characteristics. The eye sockets in birds are relatively bigger than in dinosaurs or crocodilians, allowing for larger eyes, and the midbrain is much bigger as well – an important centre for tracking movement during flight. The larger eyes and brain, especially the midbrain portion, allowed birds to develop better visual senses and processing of visual information. These features are evident even in the earliest birds, such as the Archaeopteryx, evolving alongside the last dinosaurs – and might have helped them survive the extinction that wiped out their relatives. The team now hope to be able to determine the exact genetic mechanisms controlling both cranial development and evolution – how does exactly the brain control skull size and shape? Dr Abzhanov said: "Evolution is the accumulation of and selection on changes made to the developmental process. Studying birds is a fascinating subject because they retain features of 'young' dinosaur ancestors, while also clearly adding their own adaptations, such as toothless beaks and wings. "Birds are incredibly successful organisms that have diversified into thousands of ecologically distinct species all over the world, across all continents and oceans. We think their paedomorphism contributed to this success, but only by knowing the underlying developmental processes can we determine how their unique adaptations actually evolved." The main methodology was to generate 3D computer tomography scans of the skulls from both extinct and modern species and employ computer software to track any changes in their shapes. The team's 3D modelling of skulls represented some of the best (and in some cases first) characterisations for many of the species in the study. Skull bones are often used to identify animal species, to classify them into groups, and to determine courses of their evolution, by tracking the changes in certain bones across species. Dr Abzhanov said: "One other useful outcome of this survey of skulls from across reptile evolution was a better ability to recognise the (often disputed) evolutionary fates of individual cranial bones, especially during the dramatic reptile to bird transition."